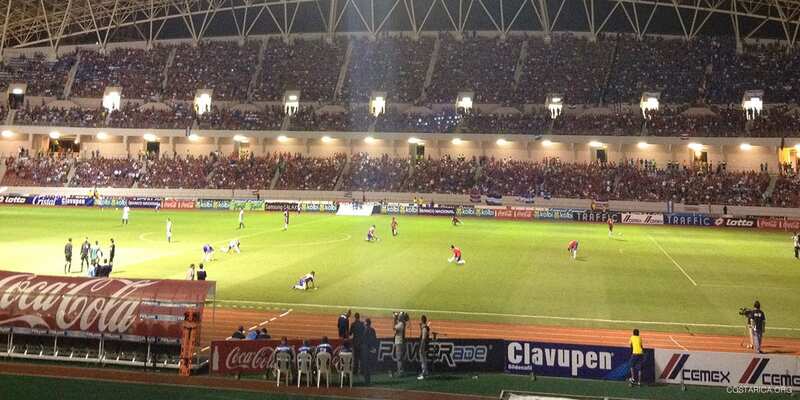 Like most of Latin America, Costa Ricans are crazy about football (known as soccer in the United States). They take the sport extremely seriously at both club and international level. While they might not be quite at the level of countries like Brazil and Argentina, the Costa Rica national team has achieved a pretty respectable level of success. Who is the Costa Rica National Team? The Costa Rica national team’s made up of the best Costa Rican players playing at home and abroad. They are a member of CONCACAF, the football federation which covers North and Central America and the Caribbean. They compete in some competitions including the Copa Centroamericana, the CONCACAF Championship, and the Olympics. Alongside this, they also play in the World Cup qualifying tournament and usually progress through to the World Cup. Their home stadium, the Estadio Nacional, is located in the capital, San Jose. This 35,000 seater venue was built in 2011 and replaced the old stadium. The old stadium was built in 1924 and was in desperate need of replacement. Their traditional colors are a red shirt, blue shorts, and white socks, reflecting the colors of the national flag. Recently, however, they have switched to wearing red socks, and their current shirt includes a white sash running diagonally across it. Like most national teams, they have a nickname – the Ticos – which is also the general name for the people of Costa Rica. The current manager is Oscar Ramirez who established himself by successfully managing Alajuelense – one of the country’s top clubs. He is also a former player and made seventy-five appearances for the Costa Rica national team. The Costa Rican team has a long tradition. Their first ever game took place in 1921 against El Salvador, and they won it 7-0. This match was part of the Independence Centenary Games which they have won – beating Guatemala in the final. They quickly established themselves as the strongest Central American team, although they did not qualify for a major international tournament until 1990. As you might expect then, they have an excellent record in the Copa Centroamericana having won the competition a total of eight times – twice that of second place Honduras. In the 1990 World Cup in Italy, they finally made it through qualifying and progressed through their group to reach the second round where they lost to Czechoslovakia. They missed out on the next two competitions, but qualified for both the 2002 and 2006 tournaments. Unfortunately, they did not make it past the group stages on either occasion. To this day, they are the only Central American team to win a match in the World Cup. Moreover, they are also the only ones to reach the second round and the quarterfinals. Their biggest win was in 1946 when they beat Puerto Rico with the astonishing score of 12-0. The last decade or so have seen the Costa Rica national team perform to their highest ever level. FIFA currently ranks them 31st in the world and in 2015 they reached the thirteenth place, which is pretty impressive for a Central American team. The future looks bright for Costa Rica, and the investment made into football infrastructure and training is starting to pay off. Much of their recent success is down to the excellent set of players who have grown up in the last few decades. Active in the 1990’s and 2000’s, Costa Rica’s highest ever goal-scorer (Rolando Fonseca), scored forty-seven goals for the national team. At the same time, Walter Centeno became a national legend, now the country’s most capped player with 137 appearances. Another famous player from the era was Paulo Wanchope, who played for several top English clubs and later managed Costa Rica. Costa Rica is blessed with a crop of players who may prove to be even better than the last generation. The current team features several players based in America’s Major League Soccer. There are Costa Ricans in England’s Premier League, Spain’s La Liga and Italy’s Serie A, too. The captain is Brian Ruiz who currently plays for Sporting CP in Portugal. He has scored 23 goals for the Costa Rica national team and has made 107 appearances. Perhaps their best player, however, is goalkeeper Kaylor Navas. He is amongst the best players in the world on his position and is the first choice goalkeeper at Real Madrid. He has set some records thanks to the low number of goals he has conceded, and will surely go down in Costa Rican history as one of their best players. They performed exceedingly well in the last World Cup reaching the quarter-finals. After drawn into a tough group, which included Italy, England, and Uruguay, few gave them any chance of progressing. To everyone’s surprise, they finished top with two wins and a draw, earning themselves a place in the second round. Here they faced Greece, and after a draw they eventually went through on penalties. The Netherlands were their next opponents, and after a hard-fought match, they lost on penalties. There was no shame in this however as the Dutch were one of the best teams in the world back then. The Ticos went home elated, having far surpassed any of their previous performances. The next World Cup will take place in Russia in summer 2018. Costa Rica will play against Brazil, Switzerland and Serbia in Group E. It remains unseen what they will achieve in the future, although it seems possible that the Ticos will reach the second round again.